Home What Are You Girls Doing Here? What Are You Girls Doing Here? 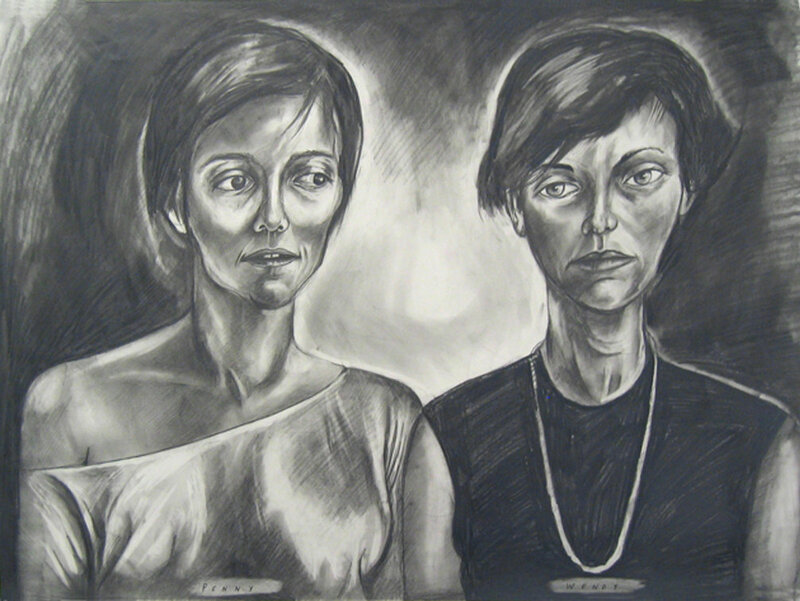 A portrait of Penny Pilkington and Wendy Olsoff by Sue Coe from 1984. For issue fourteen, Triple Canopy senior editor Lucy Ives sifted through the loose photographs, tickets, clippings, and roughly thirty spiral notebooks that constitute the David Wojnarowicz Collection, sharing excerpts of his journals in “Years Ago Before the Nation Went Bankrupt.” Ives sat down with Penny Pilkington and Wendy Olsoff, the cofounders and owners of PPOW Gallery, which represents the Wojnarowicz estate, and discussed an influential Avery Label sheet, inventing an agenda, and their seven gallery spaces. Lucy Ives: Maybe we could start with the day you met. Wendy Olsoff: Penny and I met working in a gallery on Madison Avenue, in 1981. Penny has a charming story. I showed her the bathroom, I think. Penny Pilkington: I thought it was very strange that you would show me the bathroom. We became roommates, probably in 1982. LI: So, a conversation came out of living together? PP: We would discuss being able to work with artists we liked, whom we chose. Our rent was $750, and we talked about finding a loft and doing exhibitions and being open on Thursday and Friday nights and Saturday and Sunday and having jobs at the same time. We found an apartment on Tenth Street and a storefront, and together the rent was $1,000. LI: So the space happened, and then you found the identity of the gallery? WO: That’s something that evolves all the time, but yes. PP: That was in August 1983. WO: We were very much fetuses at that time. LI: But presumably able to walk and feed yourselves? PP: What we brought to opening the gallery that was slightly different from the other East Village galleries—I mean, we didn’t actually know that the East Village was going to take off at that point—was we had worked in galleries. WO: The others were artists and less trained in the paperwork aspect of a gallery. We had worked for very tyrannical people, who instilled good systems in our brains. LI: Were there artists you had in mind to show right away? PP: While we were renovating the space we were going out in the evenings and on the weekends, visiting as many artists’ studios as possible. WO: Neither one of us had very much information about contemporary art. I had studied art history as a minor, at William Smith College, Renaissance, Rococo, Baroque art. Penny’s parents owned a gallery, and she studied sociology. We kind of knew what we liked when we saw it, but we didn’t have anything articulate to say about it. Which is kind of amazing, I think, sitting here thirty years later. When we opened, we’d just meet people and say, “Tell us what artist to go see.” One person gave us a list that was an Avery Label sheet with thirty-three names on it, and we’d just go. I would not do that today! But it was fun. In fact, as we were painting the apartment upstairs, the East Village suddenly became “hot,” and the Voice in those days was something everyone wanted to read, or I did, and Kim Levin was the writer, and Penny answered the phone one day and said, “Kim Levin’s on the phone. She wants to know what our agenda is.” And I didn’t even know what that word meant. LI: What were the first shows like? PP: The first show that was documented, in a sense, was Sue Coe. And Sue Coe was very important to us. We spent a lot of time with her. She steered us in a more political way. That was our first proper show. We had an opening, and we made sales, and we had a review in Artforum. WO: Sue was an inspiring person; she was such a huge influence on so many people. And she was friends with Art Spiegelman and Françoise Mouly from RAW, so we got drawn into that whole community of people. PP: Then we moved to Eighth Street, and we showed Erika Rothenberg. WO: She was one of the original Guerrilla Girls. PP: On Eighth Street we had a very beautiful, very minimal space. WO: John Pawson designed the space. He was a very young, very scrappy architect. People would come in and go, “What are you girls doing here?” We’d be like, “Come in. Relax.” [Speaking in voice of visitor] “How do I get out of here?” And we’d be, “I don’t know! You have to walk really far. On the subway.” And then, that space, we stayed for? PP: For barely two years. WO: No one was coming to the East Village anymore. You could get bigger spaces in SoHo, on Broadway. Nothing was on Broadway but sweatshops, where all those shops are now, like American Eagle and all that. PP: With high ceilings, those nice cast-iron columns and so on. We were moving to SoHo the summer that the riots took place, and our street, Eighth Street, was closed off for three months. Had we stayed, we would never have survived. But we were lucky, very lucky. We moved in ’88, and that’s the first year that we showed Bo Bartlett and David Wojnarowicz and Carrie Mae Weems. WO: And in that space, we stayed there for? WO: Nine years! I had two children in those years. And we also had a recession. Galleries were closed all over the place. We were open, and all around us were empty spaces. And friends died. A lot of friends died in those years. PP: And that’s when we started showing Martin Wong. Our first show with him was ’91. PP: And so far away. WO: So we moved into a space that was completely renovated on Broome Street, closer to Jeffrey Deitch, when there were still galleries down there. Josh Baer was there, and he had put a lot of money into the space, and he went out of business, and we took over his 7,500-square-foot space on Broome Street. We were in that space on Broome Street during September 11. It was another really terrible, terrible time, as you can imagine. We would do shows in that space and have press and do fantastic openings and no one would come. SoHo was totally dead. So we rented a small space on Twenty-Fifth Street as a secondary space. Then we realized that was a very stupid idea. PP: It was very hard to be in two places, even when you thought you could do it with a computer, with remote access. You were never in the right place. But we stayed, we sublet the Broome Street space for five years, and we moved completely to Chelsea, which—we moved from a 7,500-square-foot space to like a 2,000-square-foot space, so it was very tight. WO: We didn’t have a viewing room where we could sit, and our offices were teeny. PP: Then we had a fire, and we moved to 555 on the same street. And then the recession. And now we’re here. WO: Is the seventh space. LI: You’ve had it for? PP: Just over a year. LI: How would you characterize it? PP: We designed it so you could have these different smaller spaces, so things could be more intimate, or you could have more than one thing going on at a time. If we designed the space, it fits in with what we want to show rather than the space determining what we show. WO: You know, I have to say, it sounds ridiculously corny, but our first storefront in the East Village, with the metal gates across it, had fantastic shows, but it was really small, and I think our artists do not need to have huge spaces. Mega-giant macho spaces, it’s not our thing. LI: So what kind of space is this? WO: This is a feminine space. It’s a girlie space. PP: It’s a girlie space, with the white floors? WO: This is a less expensive space. You know, the younger artists we show, it really didn’t help them, when we were in that big space on Twenty-Fifth. You’d stretch to fill the whole thing, and the power of the work is dissolved.